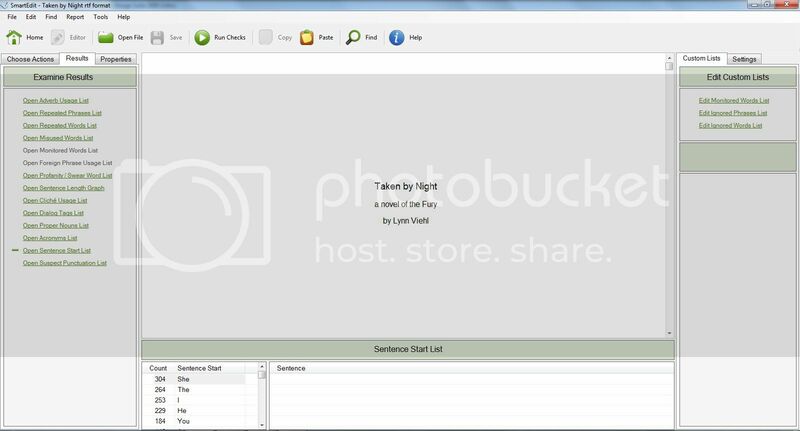 Last summer I discovered a freeware editing program called SmartEdit, which analyzes any text you feed to it and provides lists of and stats on adverbs, clichés, repeated words and other problematic content with the text. The program was so useful that ever since I've been recommending it to other writers. In December SmartEdit went pro, and while it is still available for a ten-day free trial, a license to use the program beyond that now costs $69.95. While I wish there was still a freeware version available for writers who have no funds, I understand that the developer has to earn a living, too. The real question for me was, is the pro version worth the investment? I decided to buy a license, put the program through its paces and find out. One thing I have to note here is that I did fry the computer on which I had downloaded the old freeware version so I can't pull up the old program to double-check if there was anything else it did; I'm going by the notes I put together for last summer's post on it. The first thing I noticed as I started up the pro version is that while the basic layout is still the same the program looks much more polished and professional and (obviously) has more options to offer. SmartEdit's scans can be fine-tuned to suit your needs, and also may serve more than one purpose. In addition to searching out problem areas, you can use the program to edit anything from a scene to an entire manuscript in one shot, discover what as well as where your weed words, echoes and other writing weaknesses are, and even create a style sheet for your story. The rest of the report provided lots of new and interesting data for me, too. For example, the scan identified fourteen different words I used that were either profanity or potentially offensive (all intentional and fine with me, but good to know in the event I want to put together a PG version of the ms. to use as a school seminar teaching tool.) My adverb usage report was nine pages long, and while I don't follow that Absolutely No Adverbs Whatsoever rule that seems a bit excessive. I need to take a hard look at my adverb usage during the final edit of the ms. and see if I can trim that down. I also started 304 sentences with She, 264 with The, and 253 with I; it surprised me that those were my top three sentence starters. I put a space in front of a dash 24 different times (typing style preference of mine, and one that most of my editors tolerate) and made one punctuation error by putting a space before a comma (which I do need to fix.) If you'd like to see a copy of the full scan report, I've uploaded it in .pdf format here. SmartEdit is ideal for me to use as part of my full ms. edit; I'll be working it into my process by running a scan as soon as I finished the first complete draft. I also intend to use it to work on eliminating some of my weed word bad habits as well as simplifying the creation of my own style sheets and foreign language glossaries. The one major issue I have with SmartEdit is that it's only available for Windows; for now you Mac and Linux users are out of luck (the developer notes that a Mac version may be possible in the future.) I have Windows so it doesn't affect me, but I know plenty of writers who are devoted to their Macs. Since this program is geared specifically toward us I think it should be available to all writers, not just the Windows users. The freeware version of SmartEdit was a useful editing tool; the pro version is even better, and I think every serious writer should take it for a test drive. You simply can't compile this much information on your own without a great deal of tedious searching and list-making. Even with close attention you will probably miss half of the data SmartEdit can compile for you with a single click. What the program doesn't replace is your internal editor; it's still up to you to analyze the scan results, make the appropriate story decisions and apply that to your manuscript. The nice thing about this program is that it's a good teaching resource for new writers who want to learn what to look for as well as what to think about when they are writing in order to get their manuscripts up to professional level. Bottom line, is it worth the purchase price? I say yes, absolutely. It's a great program, and I appreciate you pointing it out. This sounds like a really useful program. I'm definitely bookmarking it to check out when I get to the editing stage. I've used the free program quite a bit. Now I want the pro--but think I need to upgrade my computer before I load more writing programs. There is another similar program, myWordCount, that runs on Mac and Windows. It also counts phrases, sentence length and Flesch-Kincaid score by sentence to help you find difficult or run-on sentences. Great review, very useful information given. Hey, I'm a Franchise! Or Maybe Not.